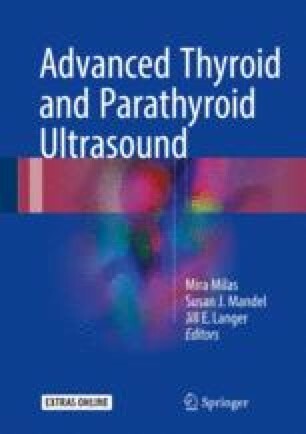 This chapter focuses on the hands-on techniques of ultrasound-guided fine needle aspiration (USGFNA) of the thyroid and cervical lymph nodes. A preliminary discussion on US selection of nodules for USGFNA, patient preparation, informed consent, and the biopsy-planning ultrasound set the stage for the procedure. The technical sections review local anesthesia for USFNA, biopsy techniques, and choices of ultrasound orientation. Difficult biopsy situations and complications are discussed. Slide preparation and on-site adequacy assessment are reviewed. Techniques of USGFNA of cervical lymph nodes are discussed. The online version of this chapter (doi: 10.1007/978-3-319-44100-9_28) contains supplementary material, which is available to authorized users. Videos can also be accessed at http://link.springer.com/chapter/10.1007/978-3-319-44100-9_28.